There are New Year’s resolutions I make that I never keep, despite good intentions. The other day I realized it was already mid January and I still hadn’t gotten around to exercising, or reading my “book of the month”. Sometimes I think to myself, would it work if I made some Reverse New Year’s Resolutions instead? I’d love to be able to resolve to (1) Eat as much junk food as I want, (2) Buy as many cookbooks as I can, and (3) Never exercise. The resolutions I like to make however, are those relating to food. Those ones I gladly keep. This year I decided that one of them was to learn how to cure fish. Curing to me has always been one of those things that only seriously weird and crazy food fanatics make. It’s right up there with the sausage making and making. Considering that I have already gone to a sausage making class AND I’ve learned how to make cheese, it was really only about time that I decided to bite the bullet and cure my own salmon. The recipe I chose was from Dietmar Sawyere’s Table By The River. Sawyere is executive chef and director of two-hat restaurant Berowra Waters Inn located on the Hawkesbury river. If you’re like me and have never had the pleasure of dining in this restaurant – some caution – reading this book will make you want to hop on the next sea plane to get there (my booking is in mid- Feb!). There is nothing difficult about curing – the one thing you need though, is patience. However, if you are new to curing, this recipe is probably the best place to start. For one, given the size of the fillet used, the curing only takes four hours, much shorter than many recipes I’ve seen that can take up to two days. 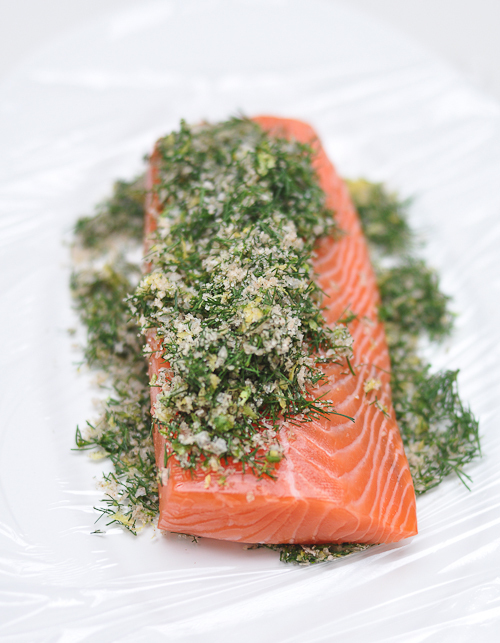 The curing recipe is only made up of coriander, sea salt, sugar, dill and citrus zest. The cured salmon is also accompanied with a crisp tortilla (next time, I’ll try using a fried wanton wrapper as well) with some spiced avocado, and topped with salmon roe. 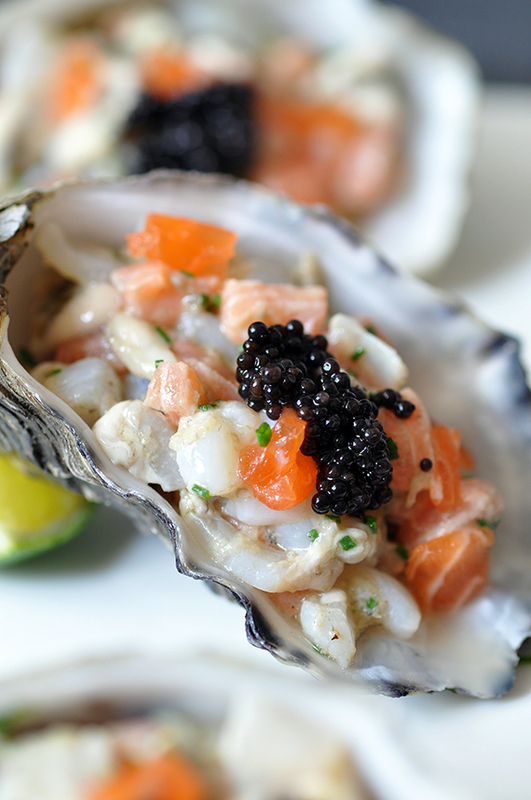 Each bite has the gorgeous sweet-citrusy salmon, the crunch of the tortilla, tang of the avocado and the “pop” of the briny salmon roe. To me, an epitome of a perfect bite. Warp the salmon in clingfilm or aluminium foil and place on a plate with a light weight on top. Leave the weighted salmon in the fridge for 4 hours, then wash the fish under cold running water and dry well with a clean cloth. Using a sharp knife, remove the salmon fillet from the skin. 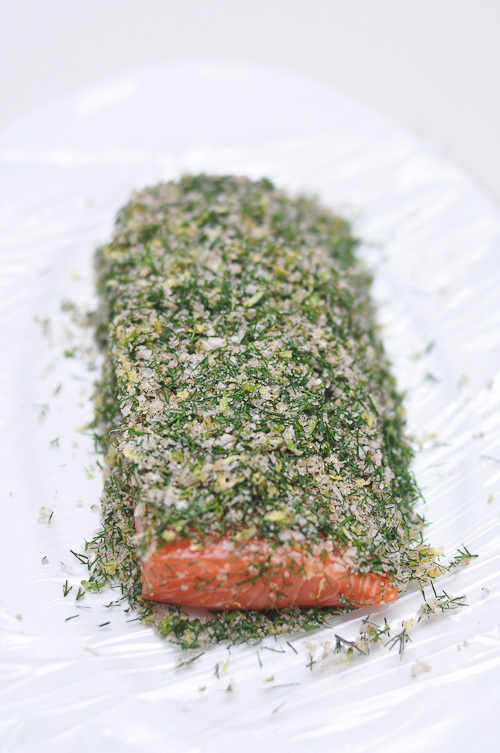 Rub the salmon with a little lemon infused extra virgin olive oil and keep tightly wrapped in the fridge until needed. Cut the avocado in half, discard the stone and scoop out the flesh. Place the avocado flesh in a blender along with the shallots, chilli, and chicken stock (or cream, if using). Blend of a puree and correct the seasoning with the lime juice and some sea salt. Cut the tortillas into rectangles and crisp-fry in some grapeseed oil. Remove and season lightly with sea salt. 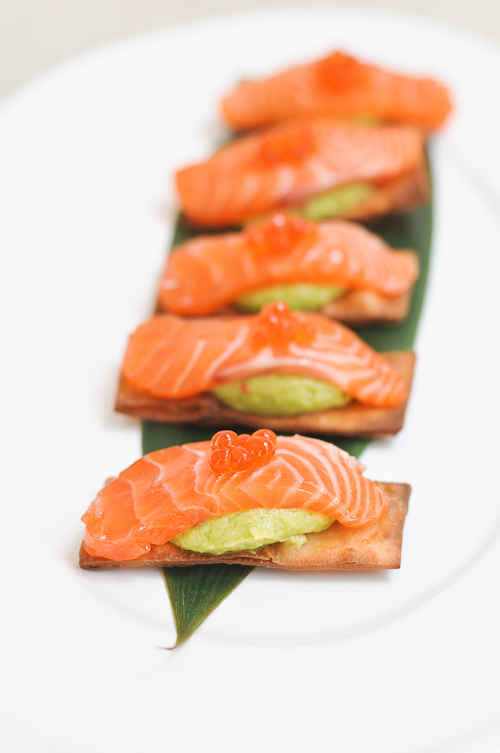 Spoon some avocado puree on top of the warm tortilla and then place a slice of the sugar-cured salmon on the avocado. Garnish with salmon roe and some micro coriander leaves. Thank you to New Holland for the Review Copy. “Well, you know I never used to like you…” I told him. And I’m still scratching my head thinking about what aphrodisiac he must have fed me to make me fall in love. Could it have been the daily belgian waffles he sent to my office? Or was Cupid’s arrow laced with the triple chocolate layered cake that he would drop off at my home after work? Whatever his recipe was, it worked! 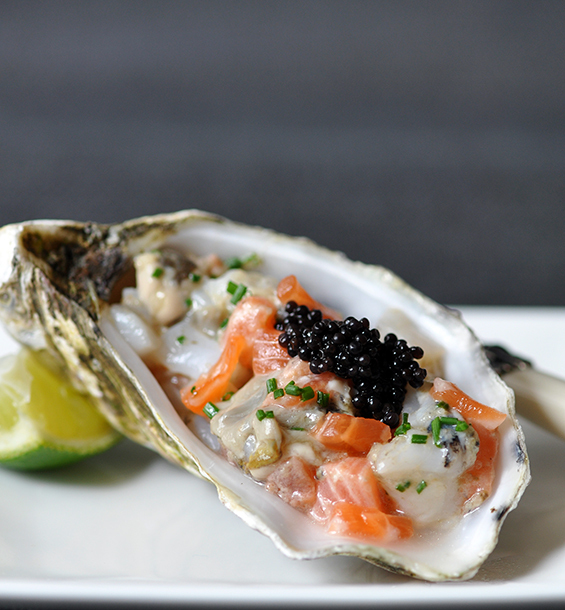 With Valentine’s a few weeks away, here’s a recipe has the three key ingredients to make a sure fire aphrodisiac – oysters, caviar and champagne (vinegar that is!). I have adapted this from one of my favourite cafes in Paris called Cafe Constant. It is owned by Christian Constant who owns several restaurants on the Rue Saint Dominique. 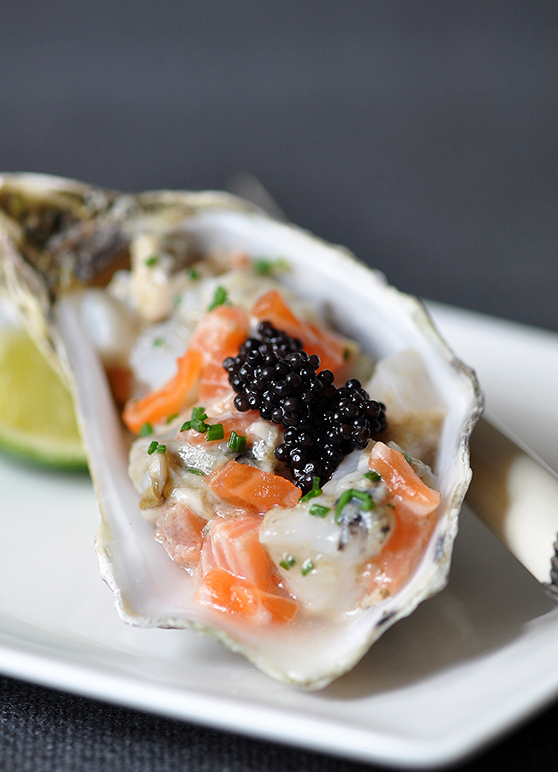 Finely chop the oysters, scallops and salmon and set aside in the refrigerator. Mix the ginger, lemon juice, champagne vinegar, chives, and olive oil in a separate bowl. Add salt and pepper to taste. When ready to serve (not any sooner! 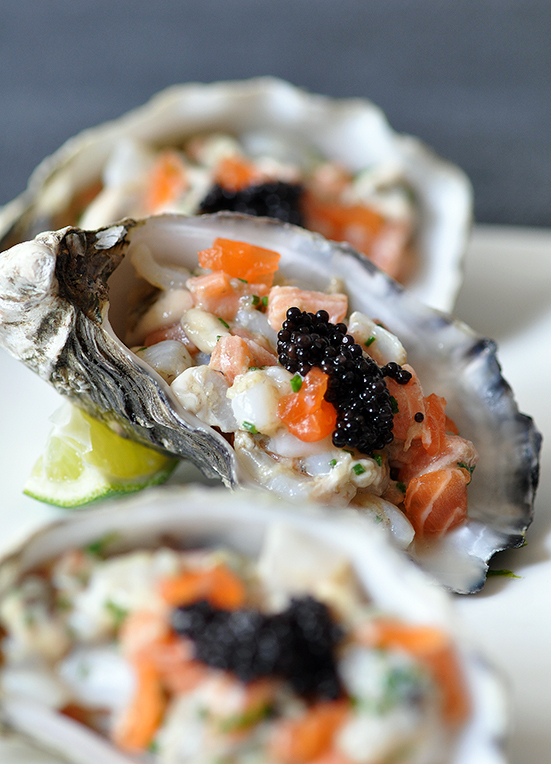 ), mix the seafood with the dressing and place on top of the reserved oyster shells.